You can detect particles from space! QuarkNet Cymru is an outreach project directed toward GCSE and A-level physics students. The project involves several hands-on laboratory activities with various types of instruments for detecting cosmic rays. The equipment is available for loan to schools with a need for particle physics laboratory equipment and school presentations are offered to students from KS3-KS5. It is a collaboration between the physics departments at both Cardiff and Swansea universities. Cosmic rays are high energy particles traveling through space. They are thought to arise from events such as stellar collisions and supernova explosions. When a cosmic ray encounters the Earth’s atmosphere, it creates a cascade of secondary particles which spread out as they travel to the surface (see below). The higher the energy of the original cosmic ray, the larger the cascade of particles when it reaches the surface. 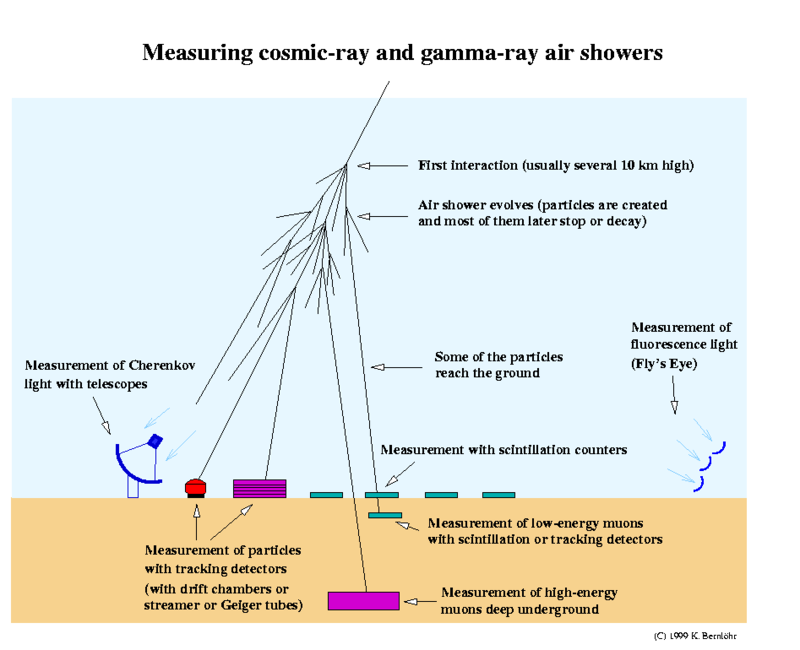 If we use detectors sensitive to some of these secondary particles (in this case, muons), we can find out information about the original cosmic ray such as its energy and its approximate origin point. Hundreds of instruments are currently in use all over the world, and thousands of students learn about topics such as space, astrophysics, particle physics, the atmosphere, and the Sun, by doing projects involving hands-on experiments. Students at Cardiff and Swansea University are currently working on preparing lesson plans and teacher materials. We have available several detectors of different types, from small handheld units to large rooftop detectors housed in ski boxes such as the HiSPARC detectors at Cardiff and (by end of 2017) Swansea University (see picture above). Requests for school presentations, teacher workshops, loans of equipment, or further information would be most welcome. Please use the contact form below for more information. QuarkNet Cymru is made possible by funding from the National Science Academy (Welsh Assembly), with assistance from the Royal Astronomical Society, STFC, Cardiff and Swansea University.